This is a great ponytail holder that shows all our American colors. There is 9 inches of ribbon on all three colors-you are getting 27 " of ribbon. The white and blue grosgrain ribbons are 7/8" wide and the red with white polka dots grosgrain ribbon is 5/8" wide. 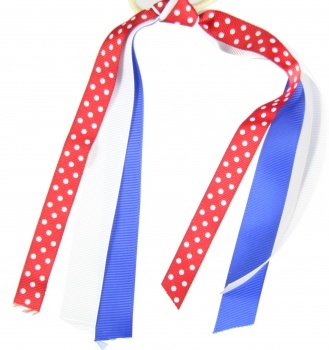 Together this ponytail holder rocks with great bold American colors.